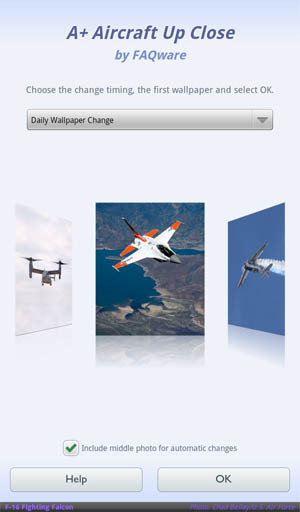 Up close Aircraft Photos with our Wallpaper app in the Nook Marketplace! Jets, planes, helicopters in close-up action! See real aircraft taking off, landing, firing flares, mid-air refueling, and more. Bonus pics include UAVs, Concorde, Blue Angels, and cockpit views. 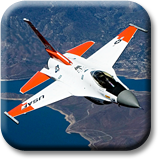 Includes 40 high quality, detailed civilian and military airplane photos with captions shown during configuration. Each photo is optimized and framed specifically for the device's HD screen. They make super cool lock-screen and wallpapers. These revolving photos change automatically each week, day, hour, minute, or have a single photo you can change anytime with just a swipe up or down! See more unique aircraft action shots in our A+ Air Power and A+ Armed Forces Gunning For Action Wallpapers. Have fun collecting them all! 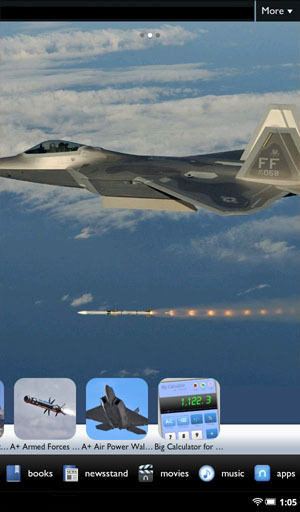 Now, select the Live Wallpaper tab and tap the A+ Aircraft Up Close choice. This brings up the preview screen, where you press the Set Wallpaper button (at the bottom) to start your new wallpaper. It comes preset to change the photos daily. After Set Wallpaper is pressed, sometimes a 15 second reset occurs as this is a normal part of the Android design for all Live Wallpapers. Personalize how often photos change, which photo to start, and select which photos to include or exclude. Start with steps 1 and 2 above to get to the preview screen. Press the Configure Wallpaper button. When you are satisfied with your options, press the OK button. This returns you to the preview screen. Now, press the Set Wallpaper button.